Vice President Mike Pence, center, tours in a helicopter over areas flooded by the Missouri and Elkhorn rivers, with Iowa Gov. Kim Reynolds, right, and Neb. Gov. Pete Ricketts, left, March 19, 2019. "It's a lot worse than I've ever seen it," said Malina Wheeldon, who went ahead with the scheduled opening of her new Euphoric Soul Salon & Boutique business despite the floods. 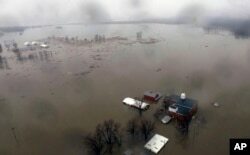 Her husband, Justin, who grew up in Brownville, agreed, saying he had lived through the floods of 1993, 2010 and 2011. "About every five years now, we have a 100-year flood," he said. 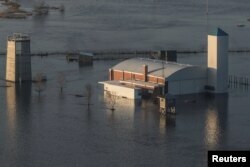 Flooded Camp Ashland Army National Guard facility is seen in this aerial photo taken in Ashland, Nebraska, March 17, 2019. "It's really too early to know for sure how bad this is going to get. But one thing we do know: It's catastrophic for farmers," said Matt Perdue, government relations director for the National Farmers Union trade group. "We're hoping it's only $1 billion, but that's only a hope."